Home TRAVEL ABROAD Asia Destinations Thailand with Liz 9/08 Thank you Ek’!!! And the new tattoos!! Thank you Ek’!!! And the new tattoos!! Here liz and I sit all packed and ready to leave for the airport at 3:30am and we miss our friend Ek and Thailand already!!! Thank you from the bottom of our hearts for the overwhelmingly gracious hospitality Ek and the opportunity to get to know you as well as your beautiful chows better. Btw….look at the trouble liz and I got into the minute you weren’t here to supervise us. Yes….these tattoos are the real deal! We got our tattoos done at at an awesome tattoo hot spot in Bangkok called Malakor Tattoo. I had designed this panda with the Chinese symbol for EARTH in the ball which signifies that what goes around, comes around in life. We protect our precious creatures as a caring planet in in turn these animals give back such pleasure to us and generations to come. We save the pandas, the pandas protect the planet. I still can’t believe I had it done!!! Yep it hurt and Liz’s even more. Tattooing on her skinny spine was excruciating I could tell. As a mom I was feeling a pang of guilt letting her go through with it but she’s 28………….and her own woman!!! Liz has had a tattoo before but mine was a first. 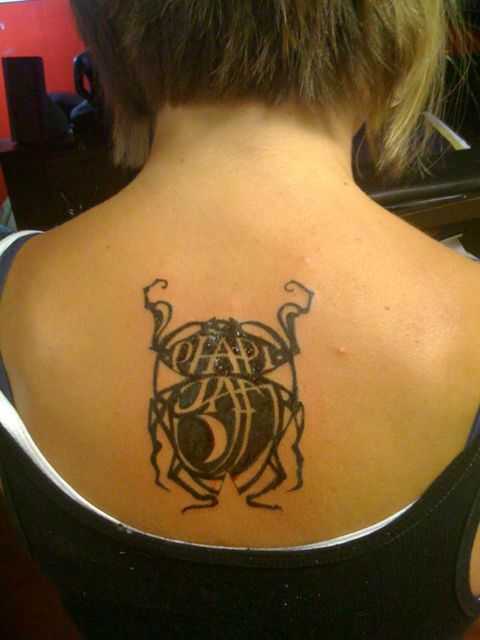 Her tattoo is a logo from a Pearl Jam concert ticket designed by one of the band members. It’s so fresh it’s still bleeding in this photo! It’s so sad to say goodbye, but we are so happy to have you back in the U.S.! Thank you Ek, for taking such good care of our very good friend and for showing her such a wonderful time! Now we have to sit back and wait to see what beautiful jewelry Sandy creates from her many purchases!!! Can’t wait! wow……that was fast!!!! it seems you just left!!! oh i adore the tattoos!!!! what does Liz’s say? 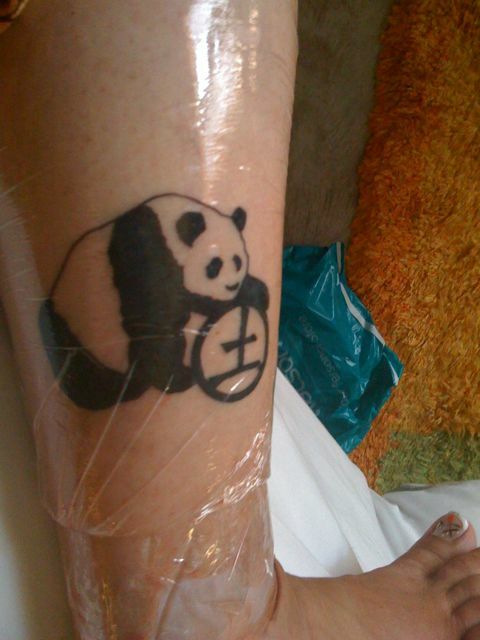 very gorgeous artwork on both and i bet that panda was rather difficult, filling in all that black. awesome!!!! what a memorable mom/daughter trip sharing all this and more!!!! You two are so lucky!!!! Krop Khun Krup is mean Thank You. Thank you once again for coming to visited me in Thailand and seeing my puppies and breeding program. I hope you and Liz will be enjoin your stay in Thailand. I did the best to host my good friend. I wigh you enjoin the food and all the hotels I booked up for you. Hey everyone..So sorry I couldn’t comment back to your notes to me while I was gone. I was using hte iPhone only and it has it’s limititations in the blog department I’m afraid. Thank you all so much for stopping in and saying HI. I really missed writing back to ya’ll!! Bonnie I have so much in my head for jewelry designs I don’t know where to start first!!!! Ek, what can I say. Liz and I are speechless. We thank you from the bottom of our hearts for the kindness and friendship you have shown to us. This was the trip of a lifetime and we have you to thank for it!